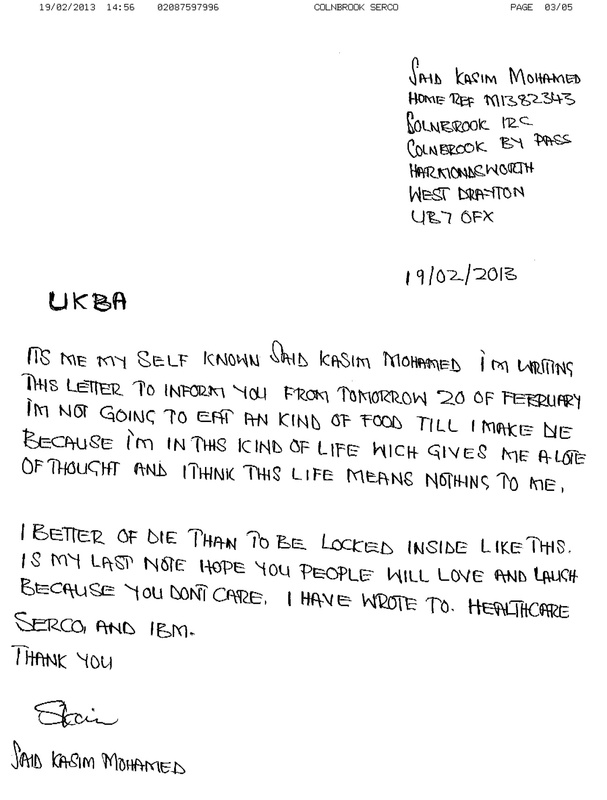 Said Kasim has informed supporters of Hands off Somalia that he has begun a hunger strike inside Colnbrook immigration prison, in protest to his extensive unlawful detention – which is now over one year – and increasingly oppressive treatment inside the prison. Said went for a further Judicial Review last Friday, only to find that the courts and contracted translation services CAPTIA had once again failed to provide Said with a Kibajuni translator. The judge adjourned his case but with no set date and ruled that Said’s removal can still take place. British courts are scrambling after paying translation service CAPITA millions, only to find out CAPTIA can not provide a proper service and constantly don’t turn up to court. MPs have even described the deal as ‘nothing short of shambolic’. Said forwarded HOS the fax below which emotionally explains his reasoning behind the protest and that he is prepared to risk his health and life in order to get his freedom. Said also sent this fax to SERCO and the medical unit in Colnbrook IRC to inform them of his protest. Doctors at Colnbrook IRC have rushed to advise Said to postpone his action as he currently takes a cocktail of medicines to help with his heart condition and depression, which were only caused by his detention. Doctors told Said that a hunger strike could prove seriously detrimental to his health as consuming the drugs he normally takes without food could damage his liver and kidneys. Said told Hands off Somalia that he is determined to continue to fight for his freedom despite the serious risks involved.